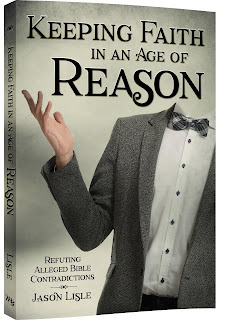 In the past couple of weeks, I have been reading a soon-to-be-released book from Master Books - Keeping Faith in an Age of Reason: Refuting Alleged Bible Contradictions. Jason Lisle has done a fantastic job with this book. It doesn't sound like fascinating reading. The premise is that there is a 'definitive list' of 439 Bible contradictions that has been floating around the internet, and Lisle goes through to refute them all. To me, it sounds like a long list, and something like reading the begats in the Bible -- you know, something that is probably important but just not something I truly want to do. 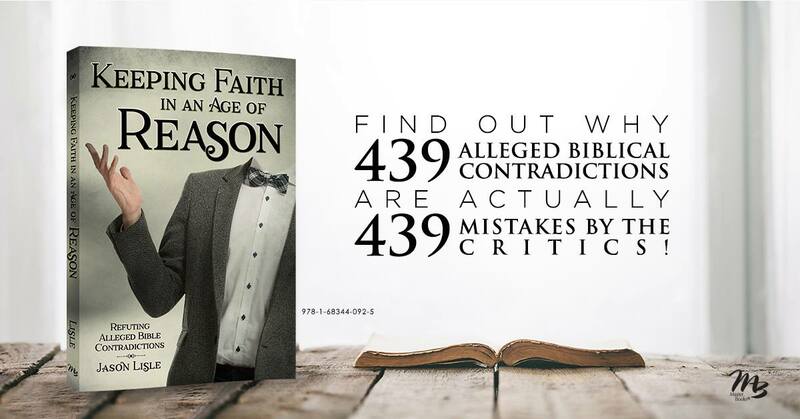 Lisle starts off with an introduction where he concisely explains some of the major logical fallacies that are present in so many of these biblical contradictions. And then the individual chapters are organized so that each addresses one main type of contradiction. I found that pretty overwhelming. Contradiction after contradiction that are basically a variation on "this gospel writer says he healed a blind man, and the other gospel says there were two." Since the first case doesn't say there is ONLY one, both of the statements could be true. Just like when I'm asked if I have a son, I sometimes will say that, yes, I do. When asked how many sons I have, I will say I have four. Both statements are true. It is also true that I have two sons, and true that I have three. I really liked seeing just how many of these contradictions are over such silly things. The introduction alone is completely worth reading. Even without reading on into the chapters with the actual contradictions, the few pages of the introduction give you plenty to chew on. Some of the responses are pretty straight-forward. Others get a bit more involved, and those are definitely more interesting. One contradiction: "How many men did David kill? Second Samuel 10:18 says 700, but 1 Chronicles 19:18 says 7,000." This is further supported by the choice of the Hebrew word harag translated “killed” or “slew.” This word also refers to the destruction of inanimate objects, such as the chariots themselves. (The word is used to describe the destruction of vines and trees in Psalm 78:47.) Even modern warfare terminology will refer to the destruction of a tank or a plane as a “kill,” regardless of how many people within are killed. Thus, to destroy 700 chariots, or chariot units, is 700 kills and could easily correspond to 7,000 individual deaths. I found that really interesting. This is a book I definitely recommend. It is very readable, and while I certainly am not going to memorize all 439 of these, this does make it so that I feel fairly confident in talking to someone who is saying that the Bible can't be trusted because of all the contradictions. I know I can answer some of these issues right off the bat... and I know I can find answers for pretty much anything someone throws my way.